Vitamin E may be beneficial to maintain a healthy heart, during the menopause and to maintain healthy skin and reproductive system. SKU: LAM8707. 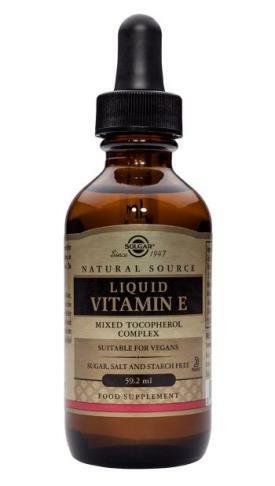 Category: Vitamin E.
Natural Vitamin E (referred to as d-alpha tocopherol) has been shown scientifically to possess twice the potency of its man made counterpart dl-alpha tocopherol, often seen in some less expensive supplement brands. 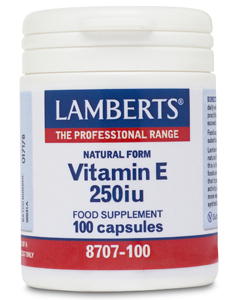 Natural Vitamin E has been hailed by many researchers as one of the most important dietary antioxidants known to man. Vitamin E may be beneficial to maintain a healthy heart, during the menopause and to maintain healthy skin and reproductive system. Suitable for Vegetarians. The following list of allergens are excluded: Wheat, Gluten, Barley, Soya, Eggs, Milk and milk products, Lactose, Nuts, Sulphites, Celery, Fish, Shellfish and Yeast. 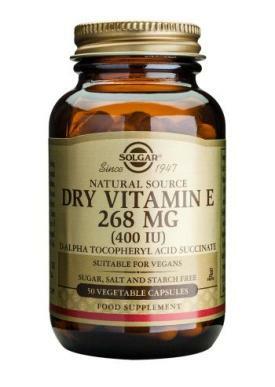 Each capsule delivers: Vitamin E (in the natural d-alpha form) 168mg (250iu) Encapsulated with: Capsule Shell (Modified Starch, Glycerol, Gelling Agent: Carageenan, Acidity Regulator: DiSodium Phosphate), Sunflower Seed Oil. If you are under medical supervision, please consult a doctor before use. Hypertensive persons supplementing with Vitamin E should commence on a low amount of iu. and gradually increase the amount under practitioner's supervision. Those using prescription blood-thinning medication (anticoagulants) or aspirin should consult their doctor before using Vitamin E supplements.